A dystopian classic, two collections by Poets Laureate, sci-fi shorts, a nonfiction juggernaut, and a powerful play. Well, Dear Readers, here we are. 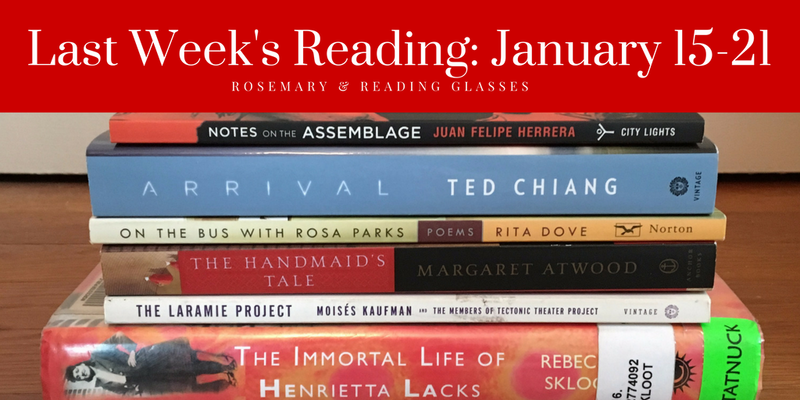 And here’s what I read last week. The Handmaid’s Tale, by Margaret Atwood: Even more frightening now than when I first read it ten years ago. If you haven’t read this classic yet, now might be a pretty good time. The Immortal Life of Henrietta Lacks, by Rebecca Skloot: I finally got a library card for our new city’s system, and then proceeded (finally) to read this medical and social history that practically everyone else has read in the six or so year since it came out. I was impressed by the volume of research Ms. Skloot conducted and the sensitivity with which she handled the stories of Henrietta Lacks’s family, but I did wish for more background on cell science and advances made with HeLa cells. If you read the book when it came out, you might want to head over to this website to read updates about the project. Arrival (original published as Stories of Your Life and Others), by Ted Chiang: I bought this collection because I very much want to see Arrival (unfortunately, I missed it in theaters), and I like to read source material first. “Story of Your Life,” which is the basis for the movie, is exceptionally good, one of the very best short stories—though it feels like a super-compressed novel—I’ve ever read. Stunning, and by that I mean I felt stunned after I read it. Also very impressive was “Tower of Babylon,” which leads off the collection. The other six stories (most of the stories in the book are very long for short stories, by the way) were interesting, but not quite my cup of tea, stylistically; they seemed, with exception of “Seventy-two Letters,” like sustained thought experiments. All the stories, however, reveal a deeply thoughtful mind at work, and offer more questions than answers; I’m glad I read them. The Laramie Project, by Moisés Kaufman and the Members of Tectonic Theater Project: This play must have been (must be) incredibly powerful in performance. It’s an exploration of Laramie, Wyoming’s reaction to the brutal murder of Matthew Shepherd in 1998. The members of the theater group traveled to Wyoming six times in eighteen months to interview friends of Matthew, friends of the perpetrators, police officers, students, religious leaders, and other townspeople; the words gathered in the interviews were shaped into the work. The Laramie Project is an act of radical witness; it’s impossible not to be moved by it. Notes on the Assemblage, by Juan Felipe Herrera (current United States Poet Laureate): The poems in this collection are political and personal, full of lamentation and exuberance. You’ll find calls to action, pleas for remembrance, elegies, riffs that feel like jazz, Spanish and English talking to each other and not speaking. “Borderbus” was for me the standout poem—heartbreaking and unforgettable. P. S. Given the busy news cycle this weekend, you might not have focused on the destructive and deadly storms in the South this weekend. If you’d like to support disaster relief efforts, here’s a link to the Red Cross donations page. You can also check out Pinebelt Relief. Nolite te bastardes carborundorum, Dear Readers. See you next week. I missed Arrival too — looking forward to the DVD release. Thanks for the heads-up on the short story collection. I didn’t realize the movie was based on a story. I hope you get a chance to read it–it’s wonderful! Nice stack of reading! I live Rita Dove. Did you know she’s been ballroom dancing (amateur) for the last number of years and you can actually see video of her online? It’s most excellent. I am going to have to look up Notes on the Assemblage for sure. I have a postal poetry friend and we are focusing our poetry reading this year on activist poets. Sound like this one might be perfect! Notes on the Assemblage would be ideal for that project. And thanks for the heads up about Rita Dove! She’s awesome on so many levels. How interesting – I was just browsing the bookshelves for my next read and almost…almost went for The Laramie Project! Must get to it soon. There are so many to feel fear for in this brave new world. Brilliant as ever. I would like to read The Laramie Project but I’m not sure I will ever be able to see a production of it. The horror of it all. Thank you! I’d like to see a production, myself–it must take incredibly talented actors to pull off dozens of roles like that (the company was six or eight actors, I think). That’s a lot of reading for one week. I’ve been getting slower lately. I love The Handmaid’s Tale and found Henrietta Lacks very interesting. I can’t imagine that this pace will continue, but I’m glad to get whatever reading time I can! I can relate. Oddly, I am finding less reading time now that I am retired.